Teaching students to be servants for the Kingdom of God begins at a very young age at New Covenant Academy. 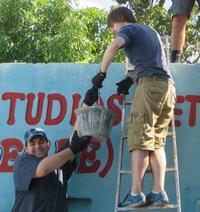 Every class from Jr. Kindergarten through 12th grade is involved each year in a number of mission projects. Our goal is to help the children look outside of their own world and get some hands on experience serving others. Over the years, the elementary classes have taken part in a variety of projects. They have been bell ringers for the Salvation Army, visited and sang to the elderly at nursing homes, collected and delivered: supplies to low income schools, books to the Missouri Hotel, and baby needs to Isabelle’s House just to name a few. The students have filled shoe boxes for Operation Christmas Child as well as collected money for a number of missions locally and internationally. The elementary students also partner with the Senior class each year to collect supplies and money for their International Mission trip. Intermediate students have participated in supporting the "Bag Ladies" ministry which is an organization that puts together travel bags full of necessities for children that are displaced from their homes. Additionally they act as Christian ambassadors for NCA at the Springfield Christmas parade, have collectively donated to the food pantry, clothing banks and much more. Class sponsors will track all Christian service hours. All Christian service must be pre-approved by the class sponsor or principal. Students in grades 9-11 may not accumulate more than 12 hours in a year with excess hours carrying over to the next year. Students may count pre-approved and verified church service for a maximum of two hours per year. Students may count pre-approved and verified school service for a maximum of two hours per year. Students may count pre-approved and verified school personal or individual service projects for a maximum of two hours per year. At least four hours of Christian service per year must be complete through organized class projects. Seniors may count all Christian service performed on the Senior Mission Trip toward completion of the hours required for their senior year. While not required, jr. high school students are given the opportunity through planned activities to participate in Christian service.